Robert McDonnell is an American politician and lawyer who served as the 71st Governor of Virginia, from 2010 to 2014. 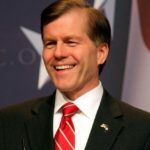 A member of the Republican Party, McDonnell also served on the executive committee of the Republican Governors Association. McDonnell was a lieutenant colonel in the United States Army Reserve. He served in the Virginia House of Delegates from 1992 to 2006, and was Attorney General of Virginia from 2006 to 2009. McDonnell was elected Governor of Virginia after using the campaign slogan “Bob’s for Jobs”. He defeated Democratic state Senator Creigh Deeds by a 17-point margin in the 2009 general election, which was marked by the severe recession of the late 2000’s. "I think the more we embrace the culture of life and respect life, the better that we do." "I think people are by-and-large happy with the providers that they have got now. They treasure that doctor-patient relationship." "Informed consent is required for every invasive medical procedure, from getting your ears pierced to having an abortion." "Besides the healthcare bill being unconstitutional and a great expansion of federal government, I think if it does not respect people’s individual religious views and makes groups or individuals do things that are contrary to their deeply held beliefs, there is going to be a visceral negative reaction." "Success in business today requires real-time, mobile access to business opportunities." "I don’t think the objective of an abortion clinic is to try to talk women out of having the procedure. That obviously would not be positive for their bottom line."